We initiated a 3-year study at the Aurora Research Farm in 2015 that will compare the corn, soybean, and wheat/red clover rotation under conventional and organic cropping systems during the 3-year transition period (2015-2017) from a conventional to an organic cropping system. We used three entry points or previous crops in 2014 to initiate the study: 1) small grain, 2) grain corn, and 3) soybean. Two of the many objectives of the study are to determine the best previous crop and the best crop to plant in the first year of the transition from conventional to organic cropping systems. Both cropping systems are being compared under recommended inputs and high inputs in the conventional cropping system (high seeding and N rates + fungicide under high input soybean and wheat) and the organic cropping system (high seeding rates and organic N rates to corn and wheat as well as the organic seed treatment, Sabrex). This article will focus on corn (days to emergence, stand establishment at the V4 and V10 stages, pre-sidedress nitrogen-PSNT values at the V4 stage, and weed densities at the V12 stage) from emergence through the 12th leaf stage (V12) of development as the transition crop following a small grain, grain corn, and soybean crop. All three studies (small grain, corn, and soybean as entry points or previous crops) were mold-plowed on May 22. Kreher’s composted chicken manure, a 5-4-3 analysis, was selected as the fertilizer for the organic corn in the transition year of this study. We estimated that about 50% of the N from the composted chicken manure would be mineralized and available to the corn crop in 2015. We applied some of the Kreher’s composted chicken manure pre-plant to the organic corn plots (50-100 lbs/actual N acre, depending upon the previous crop, and if the plot was the recommended or high input treatment) on the morning of planting, May 23, and then culti-mulched all three studies. We planted the treated (insecticide/fungicide seed treatment) GMO corn hybrid, P96AMXT, in the conventional system; and its isoline, the untreated non-GMO, P9675, in the organic cropping system at two seeding rates, ~30,000 kernels/acre (recommended input treatment) and 35,000 kernels/acre (high input). We applied about 250 lbs/acre of 10-20-20 as a starter fertilizer treatment to corn in the conventional cropping system. In the organic cropping system, we applied about 325 lbs/acre of Kreher’s composted manure as a starter fertilizer. We also added Sabrex, an organic seed treatment with Tricoderma strains, in the seed hopper to the non-GMO, P9675, in the high input organic treatment. We planted both hybrids with the same John Deere 7200 MaxEmerge planter. We side-dressed the conventional corn at the V6 stage (June 26th) at 80 lbs of actual N/acre (soybean as the previous crop) and 120 lbs/acre (corn and small grain as the previous crop) with liquid N (30-0-0) under recommended inputs and 120 to 160 lbs actual N/acre under high inputs, respectively. 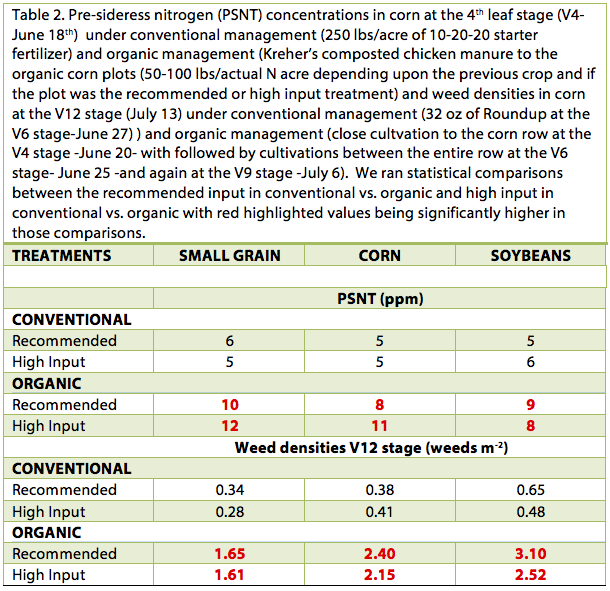 We side-dressed composted chicken manure to organic corn at the V4 stage (June 18) at estimated N rates that would closely match the total N rates in conventional corn (105 lbs/acre total N and 145 lbs/acre total N depending upon the previous crops) and high input treatments (145 and 185 total N/acre depending upon the previous crops). We applied Roundup (PowerMax) at 32 oz/acre for weed control to conventional corn at the V6 stage (June 27) under both recommended and high input treatments. We used the tine weeder to control weeds in the row in organic corn at the V2 stage (June 5), if corn was the previous crop but not in the other two experiments. We then cultivated close to the corn row in both recommended and high input organic treatments at the V4 stage (June 20) with repeated cultivations between the entire row at the V6 stage (June 25) and again at the V9 stage (July 6). Weather conditions were warm and dry for the first 7 days after planting. Corn emergence (50% of the plants emerged) differed between corn in the conventional and organic cropping systems regardless of inputs for all entry points or previous crops (Table 1). 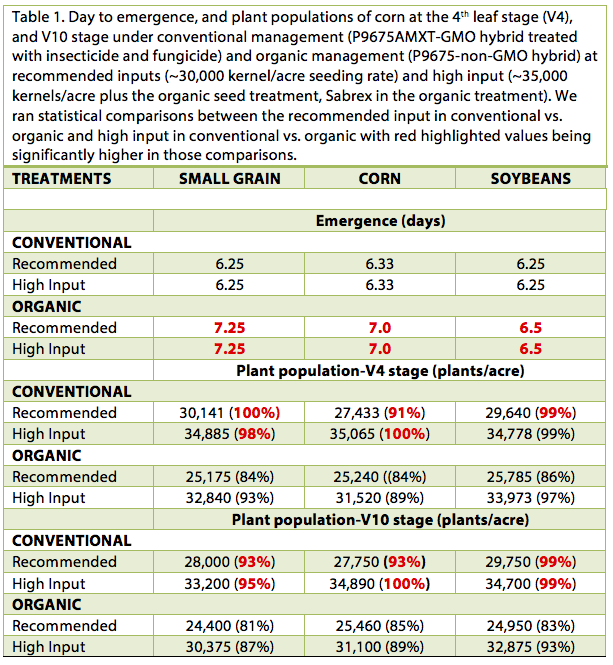 The non-GMO P9675, with or without the Sabrex seed treatment, compared with its isoline, the GMO P9675AMXT with seed treatment, required 1 day longer to emerge following a small grain, 0.67 days longer if corn was the previous crop, and 0.25 days longer to emerge if soybean was the previous crop. Corn in the recommended and high input organic treatments required the same number of days to emerge so Sabrex did not hasten emergence in organic corn in all three studies (Table 1). We estimated corn plant populations in all treatments at the V4 stage (June 18), just prior to the cultivation close to the corn row on June 20. Corn in the conventional cropping system in all three studies had greater plant populations or stand establishment than its counterpart treatments in the organic cropping system (Table 1). Corn in the conventional cropping system under recommended inputs had 91 to 100% early stand establishment compared with about 85% corn establishment in the organic cropping system under recommended inputs. It is not clear whether the GMO trait (Bt rootworm) or seed treatment (fungicide and insecticide) contributed to the differences in days to emergence and early stand establishment between the isolines in the recommended input treatment. We estimated corn plant populations again at the V10 stage (July 7) after the last cultivation in organic corn on July 6 to see if cultivation resulted in a decrease in corn populations (Table 1). Corn under recommended inputs had 93 to 99% final stand establishment with final stands ranging from 27,750 plants/acre (small grain as previous crop) to 29,750 plants/acre (soybean as previous crop).We believe that final stands of 27,750 plants/acre or greater is adequate for maximum corn yields, even in high-yielding years. In contrast, corn under recommended inputs in organic cropping systems had somewhat lower final stand establishment at the V10 (81 to 85% establishment) compared to the V4 stage indicating some slight damage to the corn stand associated with cultivation. We do not believe that final corn stands ranging from 24,400 plants/acre (small grain) to 25,460 plants/acre (corn as previous crop) are adequate for maximum corn yields. Early and final corn stand establishment in the conventional cropping system in the high input treatment ranged from 95 to 100% in all three studies. Final stands of 33,200 to 34,890 plants/acre are more than adequate to maximize corn yields, but could even be detrimental if conditions are dry in the 10-14 day period from before to after the tassle/silk period (R1 stage). Early and final stands in the high input organic cropping system ranged from 87 to 97%, higher than in recommended input treatment in the organic cropping system. Apparently, Sabrex, the organic seed treatment, contributed to 5-10% higher early stand establishment in corn. Final corn stands at the V10 stage ranged from 30,375 to 32,875 plants/acre in the high input organic treatment, which should be more than adequate to maximize corn yields. We took soil samples at the V4 corn stage (June 18) to conduct the Pre-sidedress nitrogen test (PSNT). Weather conditions were extremely wet and cool at the Aurora Research Farm in June. Monthly precipitation totaled a staggering 8.0 inches, double the average, and temperatures averaged 2.5 degrees below normal. Cool, wet conditions artificially lower PSNT concentrations because it inhibits microbial activity, which mineralizes and allows for the release of organic N. Consequently, PSNT values were low, especially in the study following soybeans (Table 2). As expected, PSNT values were consistently higher in the organic corn plots because of the pre-plant composted manure applications, but values were relatively low regardless of the amount applied pre-plant or the previous crop. We attribute the low values in all plots to the incredibly wet and cool conditions in June. Weed densities were consistently higher in the organic corn compared with the conventional corn, regardless of inputs (Table 2). Wild buckwheat was the dominant weed in the conventional corn but weed densities were low as was the biomass of the wild buckwheat (surviving plants were pale and yellow/reddish in color and not very robust after the Roundup application). In contrast, dominant weeds ranged from wild buckwheat, barnyard grass, Pennsylvania smartweed, pigweed, lambsquarter, and other perennial and annual weeds in the organic corn. In addition, the weeds in the organic corn plots were quite robust and had much greater biomass. We believe that weed densities of greater than 2.0 weeds m-2 could result in yield reduction, especially if weather conditions become warm and dry in the 10-14 day period before and after the R1 stage but even continuing into the R4 stage. Interestingly, weed densities were lower in the high input vs. the recommended input treatment in the organic system when corn or soybean was the previous crop, presumably because the higher corn plant populations resulted in a more competitive corn crop with weeds. In conclusion, corn emerged earlier in the conventional compared with the organic cropping system and had higher early (V4) and final (V10) plant populations. We are not sure if more rapid emergence and higher plant populations were associated with the GMO trait (Bt rootworm) or seed treatment (fungicide and insecticide) of the GMO corn hybrid. We believe that the final plant populations (27,750 plants/acre to 29,750 plants/acre) in the conventional system with recommended inputs are adequate for maximum yield. In contrast, final plant populations of 24,400 plants/acre to 25,460 plants/acre may not be adequate in the organic cropping system under recommended seeding rate (~30,000 plants/acre), despite ideal conditions for emergence in the 7-day period after planting. Furthermore, weed densities were greater in organic corn under the recommended input compared to the high input treatment following corn (2.40 and 2.15 weeds m-2, respectively) or soybean (3.10 to 2.52 weeds m-2, respectively). Corn seeding rates may be an area that requires further research to determine what seeding rates are optimum in an organic cropping system. Although the PSNT values were greater in organic compared with conventional cropping system, the N status of the high and recommended input treatments in the organic cropping system looked very short of N throughout from the silking (R1) stage (~July 27) through the ½ milk-line (R5.5) stage (~September 15), which could greatly reduce yields. In contrast, the side-dress fertilizer N application looked to provide adequate N to the high and recommended input treatments in the conventional cropping system. We will measure stalk nitrate-N concentrations shortly before harvest to confirm these observations. Weather extremes in 2012 and 2013 impacted corn silage and hay yields for many dairy farms in New York, prompting a growing interest in double cropping of winter cereals for harvest as high quality forage in the spring. From 2012 to 2014, forage yields were measured for 19 cereal rye fields and 44 triticale fields in New York where the winter cereal for forage followed corn. Yields averaged 1.62 and 2.18 tons of dry matter (DM) per acre for cereal rye and triticale, respectively, and 71% of all fields in the study exceeded 1.5 tons DM/acre (Ketterings et al., 2014). To learn from farmers’ experiences, 30 New York farm managers that had grown winter cereals for forage were interviewed. Surveyed farmers planted, on average, 8% of their tillable acres to winter cereals with the intent to harvest as forage. Triticale was most frequently used (70%), typically seeded with a drill (57%). Farmers identified timely fall seeding as the biggest challenge with double cropping of winter cereals. Despite challenges and production questions, 83% of the surveyed farmers planned to continue to grow double crops. The economic analysis sought to answer three questions: (1) What are the costs of production associated with double cropped winter cereals for forage following corn silage? ; (2) What are the expected changes in profit associated with double cropping? ; and (3) What yield levels ensure that adoption of a double cropped winter cereal will be a profitable change? For this analysis, five general scenarios were defined (Table 1). 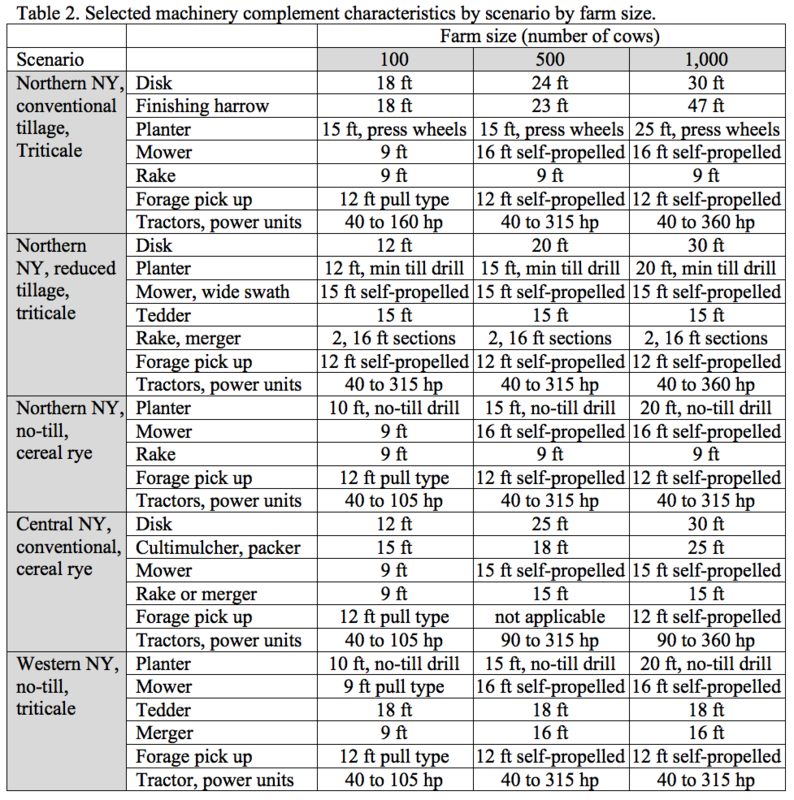 Producers helped to describe the machinery complement, including size of tillage, planting and harvesting machinery, tractors, and self-propelled units for three dairy farm sizes: 100, 500 and 1,000 cows (Table 2). Scenarios reflected cultural practices, hours per acre by task, input use, and other factors typical or recommended for the region. Cost concepts, including variable and fixed costs, machinery costs based upon hours of use per acre, and others, were used to estimate costs of production for different scenarios. Lazarus (2014) provided machinery ownership and operating cost per hour estimates. All analyses reflect 2014 price levels. Partial budgeting was used to estimate changes in profit associated with the double crops versus no winter crop, where profit equaled value of production, income minus the costs of inputs used in production. A partial budget analysis answers four questions: (1) What increases in value of production are expected? ; (2) What decreases in costs are expected? ; (3) What decreases in value of production are expected? ; and (4) What increases in costs are expected? The first two items combine to increase profit, while the third and fourth items combine to decrease profit. Costs and changes in profit resulting from key variable alternatives were estimated. For costs of production estimates, N application at spring green-up was set at 0 or 75 pounds per acre (two scenarios, based on early research), while expected winter cereal forage yield was 1, 1.5, 2, 3, or 3.5 tons DM per acre (five scenarios, reflecting yield distribution realistic for New York). To estimate the sensitivity of expected changes in profit, we used a forage value of $130, $180, $200, or $220 per ton DM (four scenarios), and defined expected change in corn silage yield following the winter cereal crop in the rotation as 0 (no decline), -0.25, or -1 ton DM per acre (three scenarios). Costs of production per ton of winter cereal DM varied by scenario and by other key factors, including expected winter cereal yield and N needs for the winter cereal. For scenarios where the winter forage averaged 2 ton DM per acre without the need for extra N at green-up, costs of production estimates averaged $94 per ton DM and ranged from $83 for no-till in Northern NY to $118 per ton DM for conventional tillage scenarios also in Northern NY. When 75 lbs of N per acre were needed to obtain the same 2 tons DM/acre winter forage yield, costs of production estimates averaged $122 per ton DM and ranged from $111 for no-till in Northern NY to $145 per ton DM for Northern NY conventional tillage scenarios. Expected changes in income included the value of production assigned to the winter cereal harvested as forage and expected change in value of corn silage production where appropriate. Expected increases in costs included labor; machinery repairs and maintenance; fuel, oil and grease; fertilizer where appropriate; seeds; spray and other crop expenses. The analyses also reflect depreciation, but only when it was considered to be use-related, that is, when use affects the expected years owned and/or expected salvage value. Expected changes in profit averaged across the three farm sizes varied by scenario and by other key factors (Table 3). Where 75 lbs of N was needed at green-up to generate 2 tons of DM per acre and a 1 ton DM per acre yield decline occurred for the corn seeded after the winter cereals due to a delayed planting date, expected changes in profit ranged from -$44 to +$16 per acre for the Northern NY conventional and Western NY no-till scenarios, respectively, and averaged -$2 per acre across all scenarios. 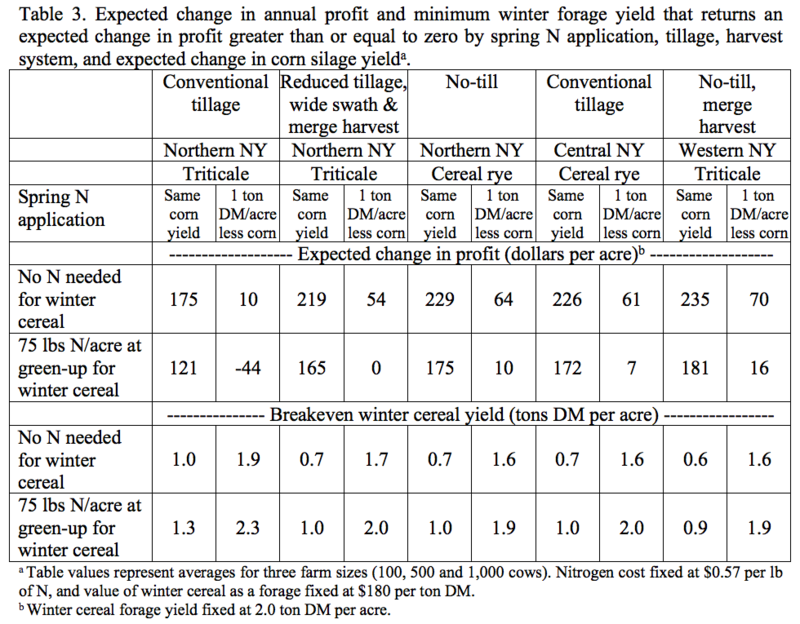 Where corn yield deceased by 1 ton DM per acre and 75 lbs N per acre was needed at green-up for the winter cereal, the break-even winter forage yields averaged 2 tons DM per acre, and ranged from 2.3 to 1.9 tons DM per acre for the NNY conventional and the two no-till scenarios, respectively (Table 3). If in the same scenario, corn silage yield was not impacted, the break-even winter forage yield averaged 1 ton DM per acre. This was further reduced to 0.7 tons of DM if no N was needed at green-up of the winter forage (Table 3). Economic analyses suggest that double cropping a winter cereal for forage following corn silage has the potential to be an economically attractive, beneficial change in practice for dairy farms in NY. This includes double cropping’s role in successfully managing risks related to meeting forage needs of the herd over time. Costs of production analyses suggest that double cropped winter cereals likely compare favorably to costs and/or values of alternative forages over a range of expected winter cereal yields. Partial budget analyses suggest that adoption of double cropped winter cereals as forages could be an economically beneficial change in practice for dairy farms (expected changes in profit exceed zero over a range of key factors). Break-even analyses suggest that producers have to obtain yields around 2 tons DM per acre to ensure that a double cropped winter cereal’s expected benefits are greater than or equal to expected changes in costs under the most demanding, least favorable set of assumptions (i.e., 75 lbs N/acre at green-up and a corn silage yield reduction of 1 ton DM per acre). Results are sensitive to a number of factors including expected winter cereal yield, expected value of forage, spring N addition needed, expected effect on corn silage yield and others. Ketterings, Q.M., S. Ort, S.N. Swink, G. Godwin, T. Kilcer, J. Miller, W. Verbeten, and K.J. Czymmek (2014). Winter cereals as double crops in corn rotations on New York dairy farms. What’s Cropping Up? 25(3): 31-33. Accessible at: http://blogs.cornell.edu/whatscroppingup/2015/06/16/winter-cereals-as-double-crops-in-corn-rotations-on-new-york-dairy-farms/. Lazarus, W.F. (2014). Machinery Cost Estimates. University of Minnesota, Extension. Accessible at: http://wlazarus.cfans.umn.edu/william-lazarus-spreadsheet-decision-tools/. Funding sources included the Northern New York Agriculture Development Program (NNYADP), a USDA-NRCS Conservation Innovation Grant, Federal Formula Funds, and Northeast Sustainable Agriculture Research and Education (NESARE). For questions about the double crop project contact Quirine M. Ketterings at 607-255-3061 or qmk2@cornell.edu, and/or visit the Cornell Nutrient Management Spear Program website at: http://nmsp.cals.cornell.edu/.